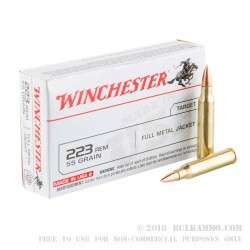 When you need quality .223 ammo at a price that’s easy on your bank account, Winchester White Box cartridges answer the call. 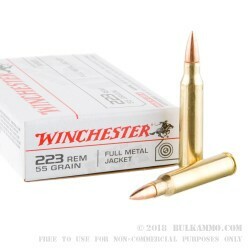 The Winchester White Box .223 Remington rounds have a 55 grain Full Metal Jacket, solid lead core bullet, loaded into a heavy duty, thick-walled, Boxer primed non-corrosive, reloadable, new brass case. They have an immediate muzzle energy of 1282-foot pounds, and their muzzle velocity is high speed at 3240-feet per second. These loads are set into little white 20 round boxes that are just what you need for the next shooting competition, or family plinking day at the range. Stock up now. 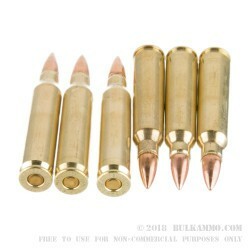 You may have heard that the .223 Remington and the 5.56x45 NATO cartridges are the same, but they are not. The .223 Remington cartridge does indeed differ from the 5.56x45 NATO load in the amount of pressure exerted on the round during ignition and in the chamber dimensions of each round. 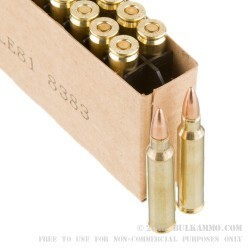 Keep in mind that you should not load up 5.56 NATO ammo into any firearm that clearly says ".223 Remington ONLY" on it. In addition to the pressure differential, the chamber lead dimensions are different in each caliber. This disparity in distance may create a pressure spike in the .223 chamber, causing many problems within the firearm.